I have been working my way through Pratchett’s Discworld series for quite a few years now. 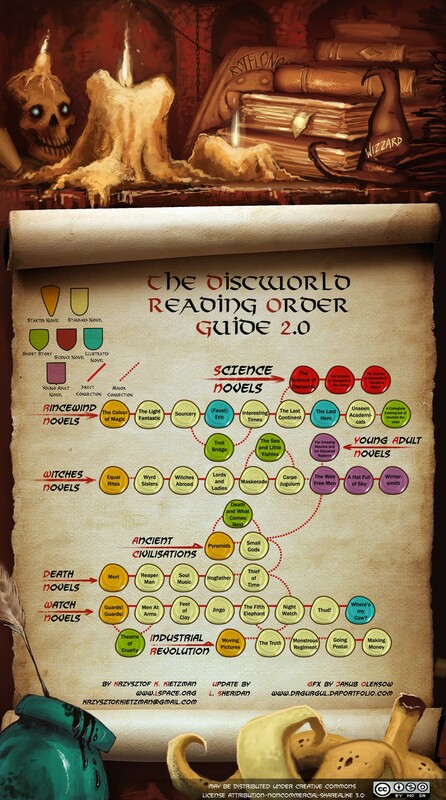 I’ve stuck pretty closely to the Discworld Reading Order diagram. It didn’t take me much more than a year to plow through all the Rincewind and Witches novels. Finishing Thief of Time marks the end of my much slower journey through the Death novels. Lu-Tze looked impressed, and said so. “I’m impressed,” he said. I can’t really explain why, because it doesn’t make a lot of sense, but for some reason I kept hearing the voice of Hermes Conrad from Futurama whenever Lu-Tze was speaking. I’m not sure what sort of similarities there should be between a Tibetan monk and a Jamaican Olympic limbo athlete turned accountant, but this is what my brain decided. Who am I to argue with my brain?